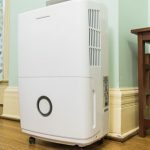 When you’re on the go or simply don’t have the space accommodations necessary for a full-sized air conditioner in your home or office, portable is typically the way to go. Portable air conditioners sound like a luxury to some, especially since these units can be expensive sometimes. But your health is worth it! Being too hot for too long can cause short and long-term health consequences, so it’s important to try and keep things at a comfortable temperature whenever possible. With the help of any of our six favorite portable air conditioners, all complete with a dehumidifier control, you can cool down anywhere that the temperature has become too high to bear. This stylish-looking portable AC unit is available in black or white to suitably match nearly any interior décor. In addition to being a fine-looking installment in your home or office, it is also a substantially powerful air conditioner for its size. Quilo offers this 3-in-1 unit as an air conditioner, dehumidifier and fan as a solution for rooms up to 450 square feet. Its ease of installation, ease of use and high-quality temperature control makes this Quilo air conditioner model one of the best portable designs that we’ve ever seen. It can even be placed in windows up to 49.6 inches, with Quilo themselves providing the installation equipment necessary. 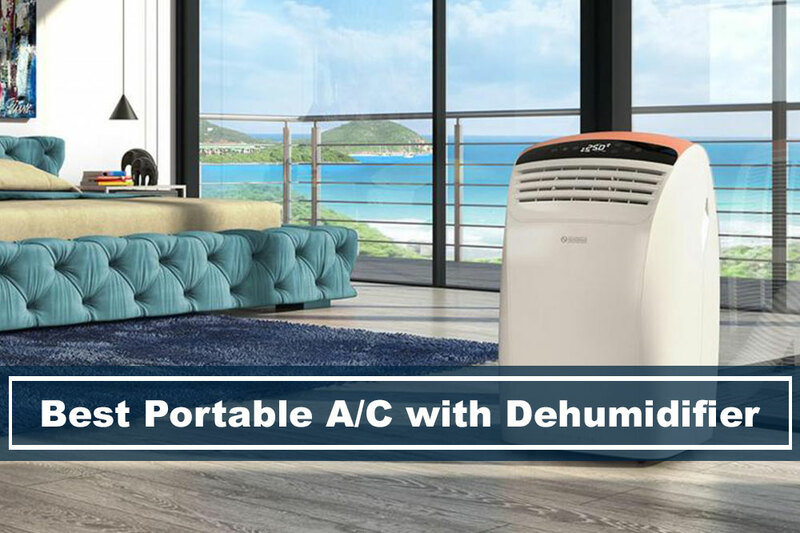 At 8,000 BTU, this BLACK+DECKER AC unit offers fan, air conditioning and dehumidifying for smaller spaces, up to 150 square feet at the height of summer when the temperatures are highest. The easy-to-use controls on this stylish-looking unit make keeping things comfortable easier than ever in your dorm room, bathroom or garage, with a sound so quiet that you’ll forget it’s even running at all! If you have a window that you can install an air conditioner in, this BLACK+DECKER model comes with the installation equipment included in purchase. If you don’t, that’s fine too! Because this portable air conditioner can be rolled to any corner of any space to keep things cool day and night. Its high-shine white and LED display make for a modern flare that perfectly complements any room. You could even put it next to your bed; it runs that quietly! Do you need to cool a space larger than what’s usually in-range for a portable AC unit? This EdgesStar model packs a 14,000 BTU punch to alleviate the heat in rooms as large as 525 square feet! If you’re not planning to keep an air conditioner running 24/7, or want to sometimes change up the temperature and settings, this unit is ideal for you and your varying needs. With fan-only and dehumidify-only settings as well as 3 fan settings and a 24-hour timer, you can control the climate in your home at the touch of a button! The EdgeStar AC unit also boasts an auto-evaporating feature, so that you’re not stuck draining or emptying buckets of gathered water. Install it in a window or use it as a standalone appliance in any room. This AC is up to the task even on the balmiest, muggiest of summer days. This AC works with you to monitor the temperature in your space for optimal performance! It can also be easily moved from room to room or installed in most horizontal or vertical-opening windows. How’s that for customization? The Honeywell portable air conditioner plus dehumidifier offers all of the benefits of a 3-in-1 fan, AC and dehumidifier design, all packed into a sleek body that will look great in any area of your home or office. Up to 450 square feet can be cooled within minutes by this powerful 12,000 BTU model-and quietly too! Whether you need a reliable dehumidifier running, a standalone AC or a three-speed fan, the Honeywell portable air conditioner has a setting to suit every need in any weather. It even comes with a remote control, so that you don’t even have to get up to change the settings. If you do need to get up and move the unit, however, rest assured that it’s as easy as simply picking it up and moving it. The lightweight design of this model is appealing for those who might need to relocate it often, as well as those who worry about an AC being too heavy for one person to safely install in a window. No matter where you need it or what elements of summer you’re trying to combat, Honeywell has got you covered. Oscillating airflow technology means that this powerful Della unit will more evenly circulate the air in any space, promoting faster and more thorough cooling. Its small design packs a powerful punch that is capable of cooling rooms up to 450 square feet, making it a perfectly powerful-yet-compact unit for even cramped spaces! There is no room that this unit cannot make comfortable. After you have programmed your ideal settings, this model will remember them in case you ever experience a sudden power outage. It also utilizes an auto-evaporation system that keeps you from having to worry about emptying a water reservoir! Cost: These devices can run anywhere between $100 and $1,000 for personal use, even more for commercial purposes. If you need a large space cooled, then you can expect to be paying more for it. Energy Efficiency: People spend hundreds of dollars each year in cooling/heating costs alone, so it’s important to consider what is efficient for your space, so that your energy bills don’t break the bank. Ongoing Costs: Does the air filter need to be regularly replaced? Does the model that you’re looking at often break or have problems in its equipment that will need to be repaired or replaced? Mobility: If you’re looking for a unit that can move from room to room with ease, you need to consider factors like weight, wheels to assist in easy movement, and size. Room Size: A portable air conditioner plus dehumidifier that’s designed for small rooms isn’t going to be very helpful in large spaces. This aspect of an AC’s design is measured in BTUs. For example, a 150 square foot room may require an AC with 5,000 BTUs while a 450 square foot space needs something closer to 10,000 BTUs. Ventilation: Your portable AC will likely need to be vented through a window. This can be accomplished via ducting that usually comes with the unit, or by installing the unit directly into a window. Which approach are you trying to take with your portable AC installation? 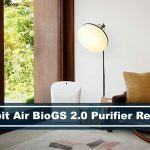 Water Storage: The best portable air conditioners plus dehumidifiers offer an auto-evaporation system so that you don’t have to mess with draining a water reservoir. What do I need to set up a portable AC? All you’ll typically need is the AC unit itself, plus a window that will serve as its ventilation. Do I need to empty the dehumidifier’s water myself? There are numerous options available for portable air conditioners that include the added benefit of a dehumidifier. Self-evaporative models, which automatically evaporate collected water. Gravity drains and condensate pumps that allow for you to attach a drain hose to the water reservoir and drain it into a different location. Manual removal models, wherein you will have to remove the water reservoir and empty it by hand. What do BTUs have to do with my purchase of an AC plus dehumidifier? Each portable air conditioning unit is measured in BTUs, which relates directly to the size of the room that you are trying to cool. Check out charts like this one for reference before making your purchase. Do portable AC units require any additional power considerations? Most portable air conditioners plus dehumidifiers operate on standard household voltage, so there is typically no need to worry about any additional power demands. Full-sized air conditioners are not practical for every household, and that’s where portable AC units come in. This manner of cooling a space of nearly any size has become immensely popular in recent years, meaning that there are options on the market to meet every need! This is great news for us, the consumers, who don’t want to roast inside of our skin when summer comes along. Whether you need to cool a small dorm room or a wide shared space, portable air conditioners can fit in almost anywhere-and with style, too! Slick black and white options and appealing LED control panels make each unit a stylishly modern statement piece in any décor. When you’re a lover of form paired with function, you don’t have to sacrifice either when you make an informed purchase of your own portable air conditioner.